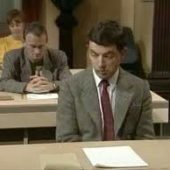 Mr Bean sits a mathematics exam and instantly begins to irritate the candidate sitting next to him by taking out an assorted number of mascots and pens. He also produces a pink panther doll and an alarm clock. Bean has studied trigonometry, but when he opens the paper he is shocked to discover that the paper is on calculus. He spends the duration of the exam trying to crib from his neighbour. At the end of the test Bean discovers, far far too late, that there were two papers in the test envelope and, with time nearly up, he furiously tries to complete his trigonometry paper. 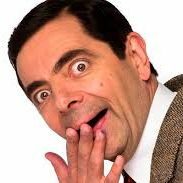 The exam invigilator yells at him to stop writing and then Bean’s alarm clock goes off to signify that the exam is over. After completing his exam, Mr Bean decides to go to the beach for a swim. After descending an enormous number of steps, he arrives at the beach only to spot a man sitting in a deck-chair nearby. Bean decides to carefully change into his swimming trunks without exposing himself by first putting on his trunks and then taking his trousers off! He triumphantly completes the task but is crestfallen when the man in the deck-chair walks away with his white stick. The man is blind! 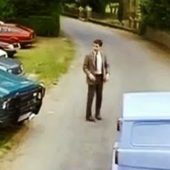 Mr Bean pops to the local church for a service. 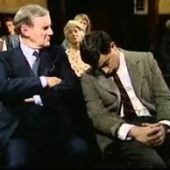 He greatly annoys the man sitting next to him by not knowing the words to the hymn, sneezing very loudly and eventually falling to sleep with boredom. 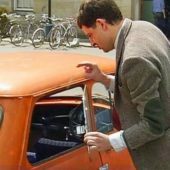 The opening of the episode introduces a blue Reliant Regal car which is overtaken by Mr Bean and then topples over. Later, Bean drives it into a ditch and pushes it out of a parking space. This episode contains most Reliant Robin gags of the series. The duration of the exam is supposed to be two hours. Only appearance of his orange BMC Mini Mk 11. Bean knocks two signs over; one in the college car park and one pointing to the beach. Bean seems surprised that he has knocked the blue Reliant into the road when he goes to the church. The hymn sung at the church service is All Creatures of Our God and King. The final scene shows Bean taking a wrong turn and crashing his Mini. The blue Reliant driver sees the crash and goes off in the opposite direction. 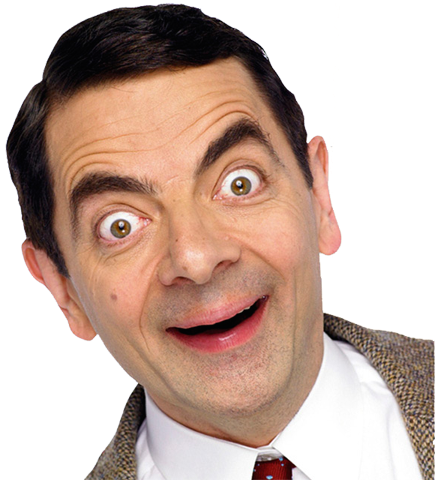 Bean: Oh yes…I’ve concentrated on trigonometry. Neighbour: I’ve done calculus mainly. Bean: Oh…I believe they concentrated on calculus last year. This episode’s opening credits are shown at the start of the first act. Only episode not to feature the Ecce Homo theme tune. This is the only episode co-written by Ben Elton. This episode won the 1990 Golden Rose award. In the first exam scene, an extra looks directly at the camera when it pans past him. The man sitting next to Bean in the exam room is not actually writing anything down when he scribbles. 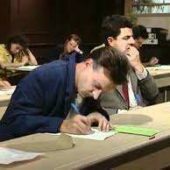 When Bean takes out his green exam paper, there is no writing on it. When Bean reverses his car into a spot in the car park outside the exam hall, crew members can be seen pushing the camera reflected in the car nearest the camera. When Bean backs into a parking space and knocks out the blue Reliant, a camera and crane can be seen reflected in the car’s window.